Last week I wrote about my plan to try to up my word count during my May Days project. My idea is that one way to manage time is to do more with the time you have, rather than to try to create more time. 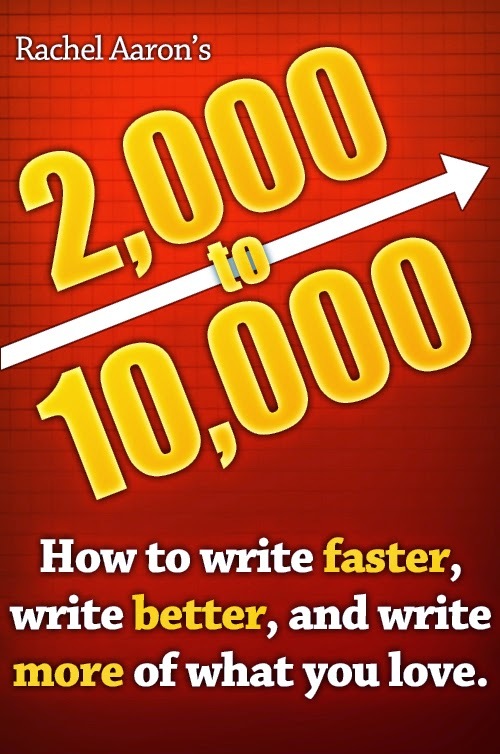 This past week I read 2,000 to 10,000 How to Write Faster, Write Better, and Write More of What You Love by Rachel Aaron to help me get prepped for writing faster. First off, I'd just like to say that this is a self-published eBook. In my experience, self-publishing, particularly of eBooks, has made it possible for writers and bloggers to toss together any kind of thoughts relating to a subject and publish them as if they're some kind of authority, when, once you've read a chapter or two, you realize they most definitely are not. That is not the case with 2,000 to 10,000! This is a very good book, and it only costs ninety-nine cents! Seriously, when I can find the time, I'm going to throw away some of the stodgy, academic writing books I've picked up here and there because the author was a well-known professor or a family member had to buy them for a college course and they made their way to me. I can see them on the shelf above my computer. My only reservation about this book is that it might be more useful to writers with some experience, people who have struggled with writing, recognize problems, and can see how Aaron's solutions can help them. A total newbie might not be as taken with 2,000 to 10,000 as I am. Aaron says there are three elements to increasing word count. The one I'm going to dwell on today is knowing what you're going to write before you get started. Over the course of my career, I cannot tell you how many times I've sat down to start a book with only the vaguest idea of what I was going to say. With my last two books (which, I must admit, I haven't sold) I stumbled upon some of Aaron's suggestions on my own because I was hunting for ways to plot ahead of time and cut down on the number of drafts I have to write. Write down what you already know about the idea you've chosen to write about. A problem I've had in the past is that I didn't know enough about my idea. It was a situation, not a story idea in which something happens to somebody. Perhaps if I'd tried this step, I would have realized I didn't have a story to tell. Or the act of writing what I did know down would have helped generate a story. Do some work on characters, plot, and setting. For characters this can involve any kind of character chart. These things are all over the Internet. I have used them, and I think you can go overboard and overwhelm yourself with too much info. Nonetheless, I have found them helpful because when you've worked out info about your characters, you get ideas for things they could end up doing and that's plot, something I've already admitted I have a lot of trouble with. Character has been a sort of back door into plot for me. For plot this can involve listing the scenes you're going to write. Aaron can do this for the entire book. I am happy if I can come up with a list of what's known as candy bar scenes and can get them in order. Aaron also talks about knowing your ending before you start. For the first time, I do have an ending in mind for the book I'm going to be working on next month. For setting this could involve creating maps. I have sketched out the floor plans of buildings. I find knowing about setting early on useful because setting has helped me with plot. Certain things can happen in some places that can't happen in others. Over the next month, I'll discuss more about what Aaron has to say in her book and how I'm using that information. Aaron talks about spending a couple of days on the kind of planning she writes about. I've spent weeks or months doing this kind of thing. I believe it's a rare day when I've written 2,000 words, so I'm not starting at the same baseline she's talking about. We'll figure out my baseline next week. In case you didn't notice, that's a Time Management Tuesday logo on the left at the top of the page. We're into logos here right now.